Serving sportsmen and advancing the conservation initiative. Date/Time: Required fields are in * Red. At least two photographs of your business. 1.) Showing the exterior building and store sign. 2.) Showing the interior of the building including inventory, fixtures, or space to be occupied (if a new business). How long has the above business been operating under this name? How long has the present owner been operating this business? If none, please list other suppliers. When ordering, please include quantity and item number with color or size numbers where applicable. We will prepare and fax/email you a proforma invoice showing all information concerning your order. Proforma includes: our order number, SHIP To and SOLD TO, quantity, item number and description, unit price, extension, page sub-totals, freight charges and invoice total. You can make modifications to this proforma until you advise payment instructions. Once you give us the confirmation with payment, the proforma will be released and additional modifications cannot be made. We do not backorder. Out of stock items should be reordered at a later date. All merchandise must be prepaid before we can ship your order. Payment may be made by credit card or wire transfer of funds. You may use Visa, MasterCard, Discover, or American Express. Wire transfer instructions will be sent to you after your application has been approved. Any overpayment of your order will be held on your account and may be deducted from your next order or per your instructions, a refund check in U.S. dollars maybe be issued. A credit will be issued in the case of credit card. Please include specific shipping instructions with each order or we will be pleased to select a carrier for you. Incoterms will be provided according with the ship to address. If the order is sent to a freight forwarder, you will be charged for the inland freight fees. When American Rod & Gun is shipping to a destination within the USA, rather than direct export to the customer, the customer/agent is responsible for all Export Compliance. For full Export Compliance Requirements (click here). If using a freight forwarder, please refer to the (Export Compliance Requirements). Orders are generally shipped within 5-7 working days after receiving payment. No exclusive rights or territories are granted. We reserve the right to approve or decline any application or order. Terms are normally COD. You may use Visa, MasterCard, Discover, or American Express. If you have been in business for over one year and would like to apply for open account, please call for a credit application. I understand and agree to all the service and return policies as specified in the current Terms & Conditions. Proper use of Bass Pro intellectual property will be provided with the approval of this application. Any proposed use of Bass Pro intellectual property must be submitted in writing to American Rod & Gun for approval; in its sole discretion, before use. You agree to promptly discontinue the use of Bass Pro intellectual property upon receipt of written notice from American Rod & Gun, in its sole discretion. You further agree not to infringe Bass Pro's intellectual property, and disclaim all right, title, and interest in or to Bass Pro's intellectual property. I have read and will comply with the attached requirements regarding the use of the Bass Pro Shops name and logo. * Signature: understand and agree to comply at all times with Bass Pro's Trademark Usage Guidelines, as provided by Bass Pro (Usage Guidelines) and the restrictions on use of the Bass Pro Trademarks as set forth in Exhibit A hereto. I understand that establishing an account with Bass Pro does not grant me a license to use any Bass Pro trademarks or other intellectual property. I agree that I will be responsible for all debts by the business listed on this application, and for all collection, attorney fees, and finance charges incurred by American Rod & Gun. Your fax number and e-mail address are used to communicate to you. By providing your fax number or e-mail address you are giving written permission to receive related information from American Rod & Gun that may be of interest to you. We will not share this information or use it for any other purpose. You may opt out of receiving faxes or e-mail from us any time in the future. By signing this application, you hereby certify your authority to do so on behalf of the applicant and that to the best of your knowledge all information provided herein is accurate. You also hereby waive all privacy of credit information rights, laws, or regulations including the Consumer Credit Protection Act of 1968 with all amendments and give permission to American Rod & Gun to verify all facts disclosed herein including the release of bank information. A signed, faxed copy of this application will be considered the original. Owner or officer signature required. As an independent retailer of Bass Pro products, you must at all times respect Bass Pro's rights in and to the Bass Pro Trademarks and comply with the below Bass Pro Trademark Usage Guidelines (Usage Guidelines). The purchase of goods from Bass Pro / American Rod & Gun does not grant you or your company a license to any of the Bass Pro Trademarks; Bass Pro grants you and your company permission to make informational references only to the Bass Pro Trademarks and only as necessary to identify the Bass Pro products you are selling through your retail outlet/s. Bass Pro owns numerous trademarks and service marks, including the trademarks and service marks identified at Attachment 1 to these Bass Pro Trademark Usage Guidelines (Bass Pro Trademarks). The Bass Pro Trademarks are solely owned by Bass Pro and you shall never directly or indirectly contest, or do anything to harm or impair, such ownership or the validity of the Bass Pro Trademarks. Advertise, promote or otherwise communicate or use the Bass Pro Trademarks in any manner that suggests or implies that you are sponsored or endorsed by or affiliated with Bass Pro. Include any Bass Pro Trademark in or as part of your in-store, online or outside signage, except as provided in these Usage Guidelines. Any use of a Bass Pro Trademark as part of an in-store display must be limited to materials provided to you by Bass Pro and must be displayed in a manner that complies with the above. You may make informational reference to the Bass Pro Trademarks, e.g. We sell Bass Pro brand fishing rods. 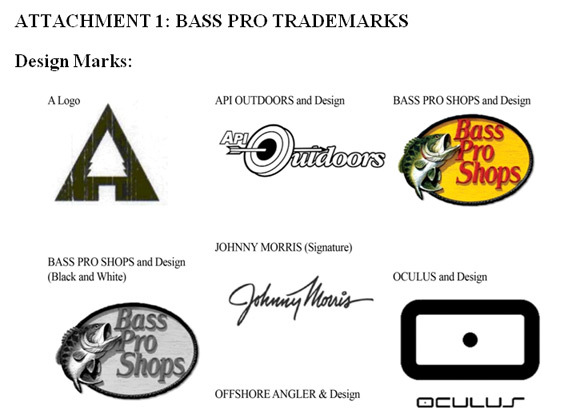 Any reference to the Bass Pro Trademarks should identify Bass Pro as the owner. 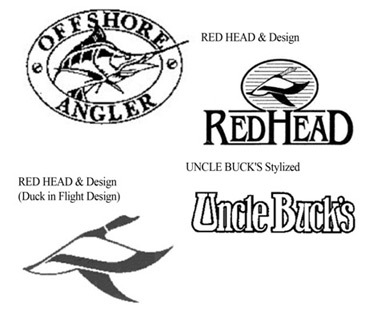 Always use the appropriate symbol (®, TM or SM) in connection with all Bass Pro Trademarks. Each use of a Bass Pro Trademark should be consistent with its registered form or proper usage and should not be altered in any manner or combined with other terms. Do not vary any Bass Pro Trademarks by changing the spelling or abbreviating the mark or altering the color or dimensions of the logo. See Attachment 2 for sample usage. Bass Pro Trademarks should always be used as an adjective and should be accompanied by an appropriate noun. Do not use a trademark as a noun or verb, or in the possessive or plural form. Upon request, you will provide copies and/or access to any materials which make use of Bass Pro Trademarks for approval by Bass Pro. You shall refrain from any use of the Bass Pro Trademarks other than as described above; any use of the Bass Pro Trademarks, other than as described above, must be approved in writing in advance by Bass Pro. In the event you are no longer selling Bass Pro products and/or upon termination of your independent retailer / wholesaler agreement with Bass Pro, you will immediately cease all use of the Bass Pro Trademarks.